I’ve officially started my first quilting project. I’ve had an idea of the type of design I wanted for quite a while but I’ve had trouble getting it quite right. I was trying to base it off the layout from the “Split rail fence” quilt square but couldn’t get what I wanted. Then suddenly, on Saturday, the idea just sprung fully-formed into my head. I knew the pattern I wanted. The scan from my sketchbook shows a few evolutions of the idea, from the rouge original sketch to a more tightly laid out design. After that, I recreated the design in OmniGraffle and played around with differen t color combinations. 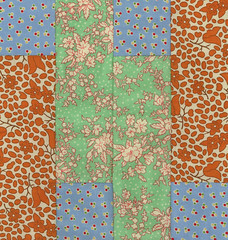 I scanned in my fabrics and dropped them into the design to get an idea of the scale and whether the colors would work together. 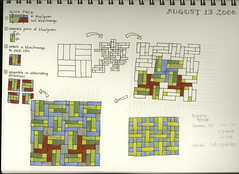 The hardest part was figuring out how to translate my design into easy-to-assemble squares. I did that in OmniGraffle too. I looked at the design and started isolating blocks that could be easily sewn and then adding on. The only change I had to make for assembly was to build the large squares out of four small squares and it turned into small and extremely easy to assemble blocks well suited for quick piecing. You can see a diagram of how they’re assembled on the sketch page. After that, I made a few squares. They turned out great! I went out today to get some more fabric and a rotary cutter so I can start making more pieces. I only found two of the fabrics this time. Hopefully I’ll find the other one at another JoAnns. Luckily, the ones I got were the green and blue, so I can work on assembling the center parts of the squares and add the orange or another fabric once I get that.